The social media platform of choice depends largely on socioeconomic status and, therefore, access to a mobile device. Teens in a household that earns less than $50,000 per year are more likely than others to use Facebook, while teens in a household that earn more than $75,000 are slightly more likely to visit Snapchat more often than their lower-income counterparts. Generally, with greater economic status, Facebook usage decreases and Snapchat/Instagram usage increases. Privacy. Today’s teenagers have hardly known a life without “wiretapping,” “NSA,” and “net neutrality” playing significant roles in the cultural vocabulary. On the micro level… teenagers have seen Facebook completely overtaken by their parents’ generation. The teenagers with any good sense know that their prospective employers will check out all their accessible social media accounts. When you add up all of these factors, a teenager’s desire for privacy in social media platforms makes a lot of sense. In January of this year, 19-year old Andrew Watts published his viral essay, “Teenager’s View on Social Media: Written By an Actual Teen.” In it, he attempts to sum up his generation’s relationship with just about all of the social media platforms and popular apps around. Essentially, Snapchat is where teenagers can feel most at-home and relaxed. It’s a low-pressure network where advertising doesn’t get in the way (…yet…) and parents and employers can’t pry. Yik Yak offers some of the same fun, but it’s all purely anonymous. With Yik Yak – which doesn’t include followers, profiles, or any elements that are so common to other social media platforms – teens and college students share and read overheard snippets of conversation from around campus. Content is up-voted based on whatever is funny or relevant. As technology prices drop, we’ll see even more teenagers shift to mobile devices and the social platforms that rely on them. I think we can also expect to see a steady increase in the popularity of social networks that protect users’ privacy or encourage anonymity. 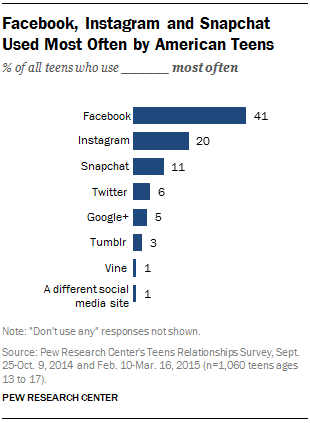 What are your predictions for teen social media use this year?